Mark your calendars for Wednesday, March 11. That's the date of this year's Ohio Wildlife Diversity Conference, hosted by the Ohio Division of Wildlife. This is the BIG one - about 1,000 nature enthusiasts of all stripes come together for what must be one of the largest one-day natural history conferences anywhere. The conference location couldn't be more convenient - it's in Columbus and right off the freeway at the cavernous Aladdin Shriners' Complex at 3850 Stelzer Road. CLICK HERE to register. There are exhibitors, artists, vendors, authors, and legions of like-minded people all rooting for nature and conservation. And of course, the talks, which cover a range of subjects. The Division usually unveils some sort of surprise for participants, and this year I do believe there will be two! I can say no more at this point, but let's say that these gifts should serve any natural history buff quite well. A group of naturalists explores an Adams County prairie, looking for rare mustards and whatever else there is to see. The keynote is Stephen Kellert of the Yale School of Forestry, and his talk is entitled People & Nature in the Modern World. It'll be an interesting and informative perspective of how we - Homo sapiens - interact with Mother Nature. On a somewhat related topic, Jeremy Bruskotter of the Ohio State University will speak about Hunters and Birdwatchers: And the Survey Says... He'll give the latest findings in trends among various groups of outdoors people, and the results might surprise you. 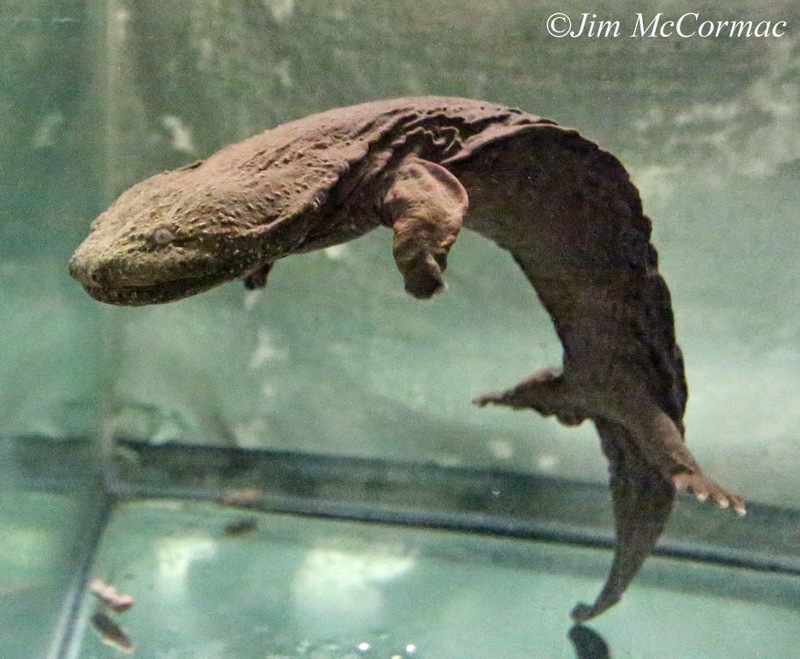 What's not to love about a Hellbender, our largest salamander, which is sometimes affectionately referred to as the "Snot-otter". Herpetologist Kent Bekker of the Toledo Zoo will delve into the mysteries of these endangered animals, and share what is being done to save them. You may think that I drew the short stick in regards to topics, but I don't think so. I'm giving a talk called Lichens: Crusty Treasure Troves of Biodiversity, with the overarching mission of casting these fungus-algae organisms in the favorable light that they richly deserve. Lichens are fascinating in their own right, but become outright amazing when their innumerable relationships with animals is taken into consideration. 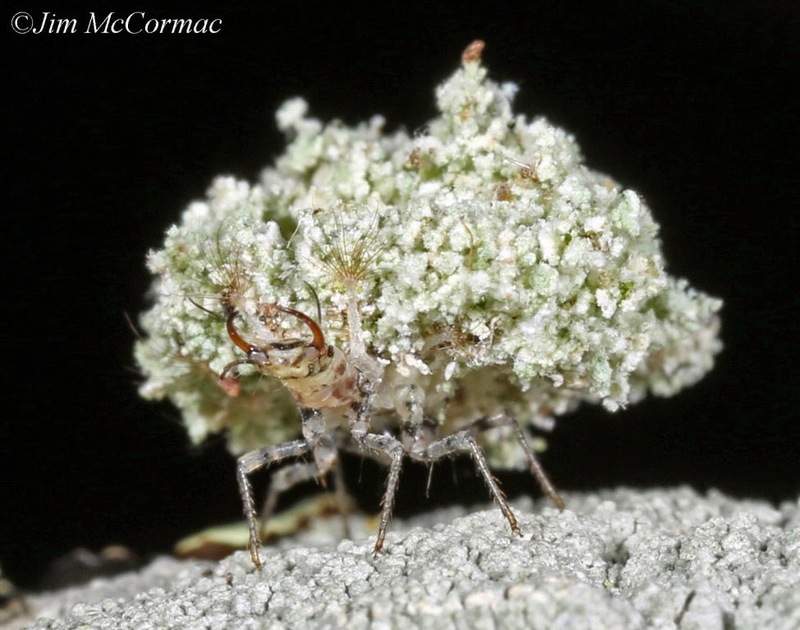 The beast above is a Green Lacewing larva, and it adorns its body with lichen bits. So camouflaged, it is adept at sneaking up on prey and slicing and dicing with those ferocious mandibles. And that weird creature is just the tip of the lichen-animal iceberg. Mute Swans seem to be taking over the world, and pretty though they may be, these invasive birds can do considerable damage in wetland communities. Division of Wildlife biologist Laura Kearns will talk all about large white waterfowl in her presentation, Swan Song: Trumpeters vs. Mutes. Like tiny Coleopteran dragons, these introduced Multicolored Asian Ladybeetle larvae are ferocious predators. In this photo, two of them bookend a fellow larva, cannibalizing it. Although this introduced species has become quite common, there are numerous other native ladybeetles, and all of them are interesting. Mary Griffith of the Ohio State University Extension Service will elaborate about these fascinating bugs in Lady in Red: Ladybugs and Ladybeetles. Biologist Geoff Westerfield will give a program entitled Urban Wildlife Resolution: How Can I Help You, and Joe Boggs of the OSU Extension will bring us up to date on a potentially devastating invasive insect in his talk, Asian Longhorned Beetle: The Threat in Black and White. I hope that you can attend, and if you do I'll wager you'll have a great time. Again, CLICK HERE for registration info. Yesterday was a work day, more or less. I left before the crack of dawn to meet other planning committee members who are involved with organizing Mothapalooza. We spent a good chunk of the day at the Eulett Center in Adams County tightening down various nuts and bolts before opening registration in a few weeks. Special thanks to Mary Ann Barnett for ably overseeing this event, and efficiently running yesterday's meeting. This will be our third Mothapalooza, and you'll not want to miss it. CLICK HERE for a brief recap of the last one. I'll let you know when registration opens. As I entered the Pike County region on my way south, the landscape transformed into a winter wonderland. A soft blanket of snow capped every twig, branch, and other structure, creating stunning vistas at every turn. Fortunately, I had built in some extra time, and stopped at a particularly photogenic locale to make some landscape images. 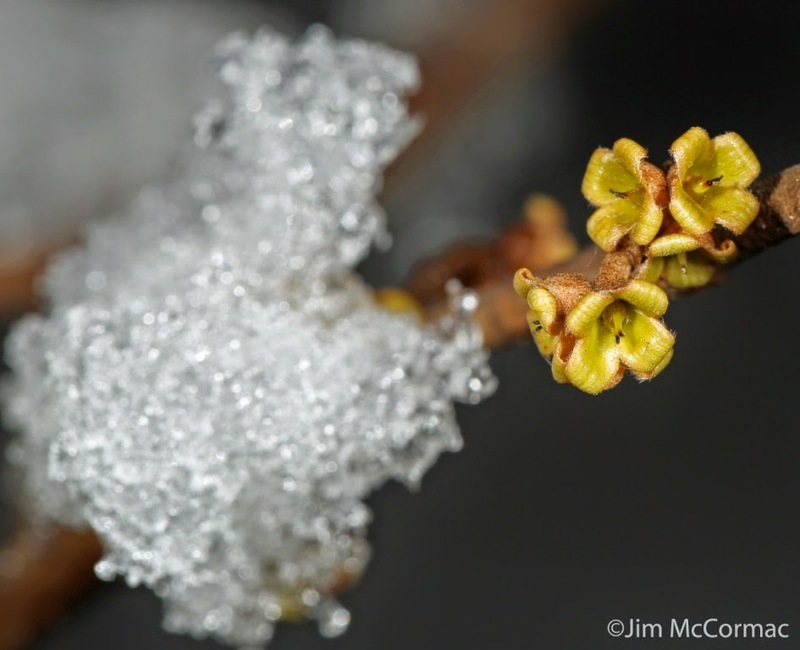 The persistent calyces of witch-hazel, Hamamelis virginiana, surrounded by icy snow caps. After all was said and done with Mothapalooza planning, I joined David and Laura Hughes for what would be a very interesting adventure. Even though we had little more than two hours before dusk settled, we made the most of it and found lots of REALLY WEIRD STUFF. Our targets were animals that live in the supranivean zone. Supra = above; Nivea; Latin for snow. In other words, animals that live on the surface of the snow. Below the snow are scores of subnivean creatures overwintering in the leaf litter and various recesses, sheltered from the exposed elements of weather on the snow's surface. We did not dig down to investigate the subniveans; our goal was to find the ultra tough invertebrates of the supranivean world. 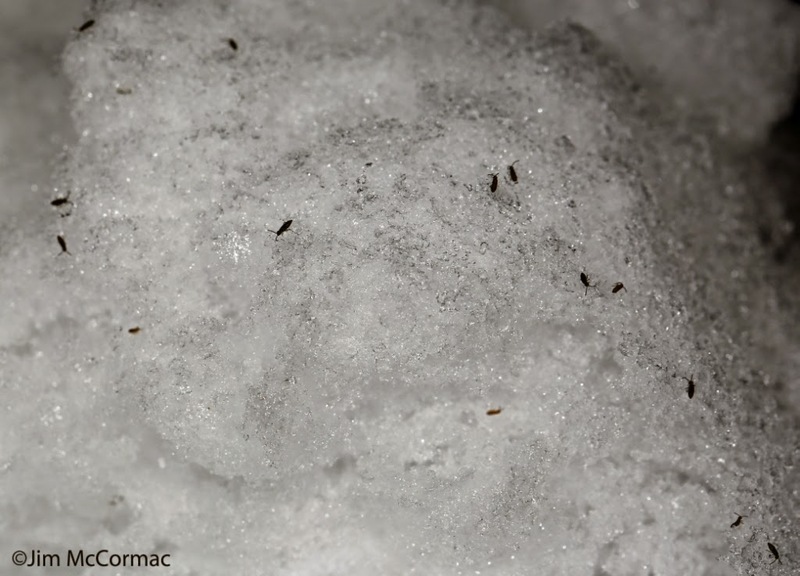 The little black dashes on the snow in the above photo are springtails (species unknown). They were everywhere, scads and scads of them. 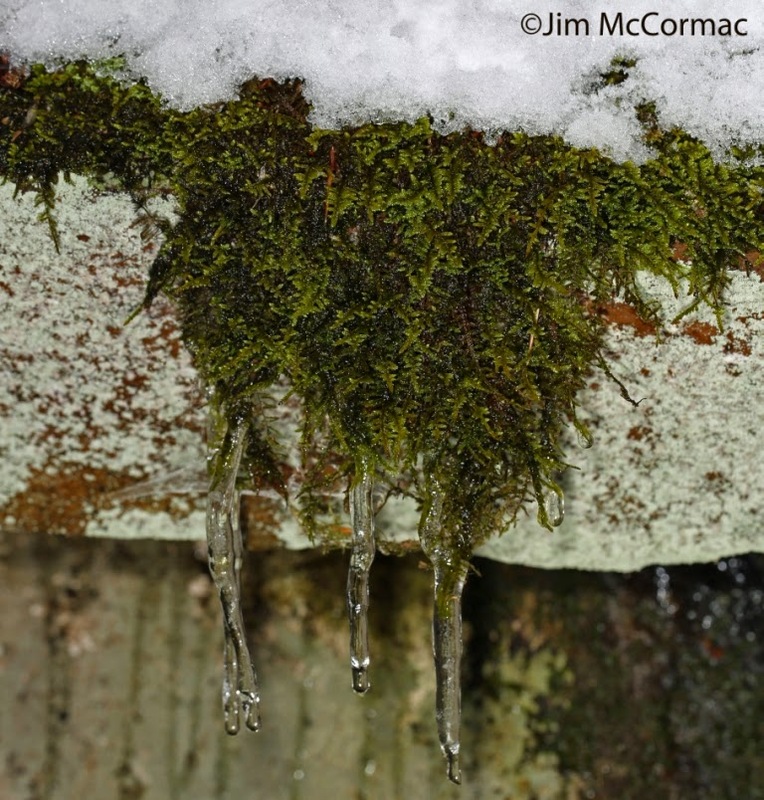 Perhaps the best known of the winter springtails are the so-called snow fleas; CLICK HERE for a post about those. 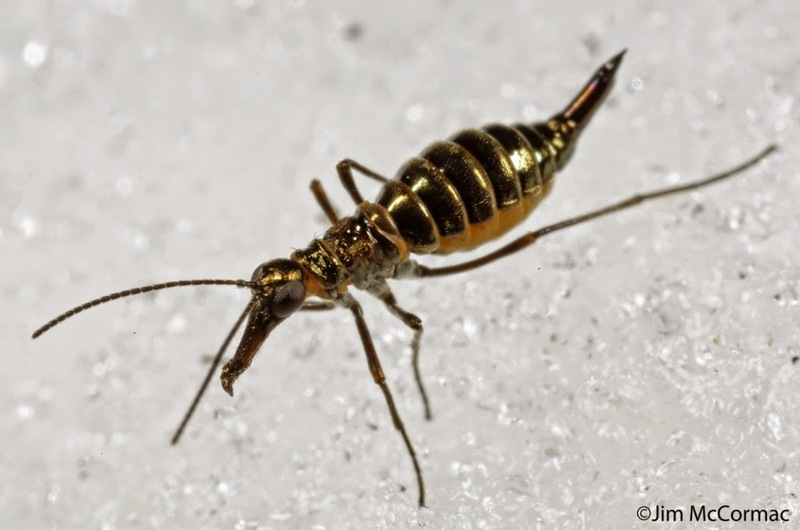 A winter stonefly rests on the surface of the snow. Note the tiny springtail between the stonefly's antennae. The stoneflies were quite frequent yesterday. As always, a trip afield with the Hughes is eye-opening and educational. Both Laura and David have powers of observation that far transcend that of the average person. Their ability to locate strange, interesting, and often ultra-Lilliputian beasts is remarkable. Laura is smitten with aspects of entomology that are poorly known, and she has become nearly encyclopedic in her stores of knowledge. Thanks to her, David and I became quite fired up to find and see the hardy animals presented herein. A wingless wasp strolls the icy surface. In spite of the cold temperatures, this animal and everything else that we encountered were quite active. While insects may be largely thought of as animals of warm seasons, and most are, there is a trove of six-legged critters for which winter is their season. This wasp is one of the species that forms galls in oaks, either in leaves or sometimes in twigs. They have evolved to emerge and reproduce in the dead of winter. This is another species of wingless oak gall wasps (presumably; we're unsure of the species). It was truly elfin, measuring perhaps 2-3 millimeters. Because of its constant activity, making photos was quite difficult and most were no good. 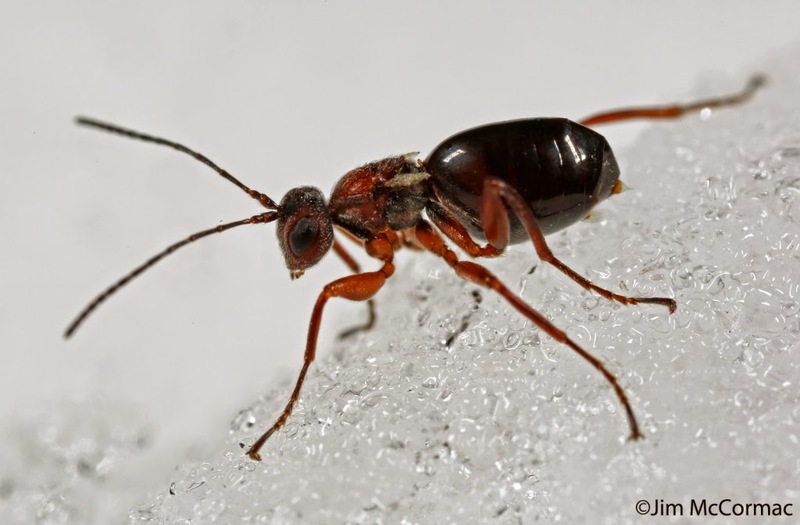 Photographing small insects on snow is challenging. David and I both shoot with Canon 5D Mark III bodies, and use Canon's uber macro lens, the strange MP-E 65 coupled to twin lite flashes. Nonetheless, imaging scurrying little critters on cold snow and constantly shifting and bouncing light is a challenge. For those of you into photography, I find that in general shooting at ISO 100, f/16, and shutter speed of 1/200 works pretty well. Be prepared to bump up the flash intensity significantly as well. David found this jumping spider, which really surprised us. It was out and active, and one has to wonder if certain predators such as this have also evolved physiological mechanisms that allow them to hunt in conditions far colder than most of their brethren can withstand. 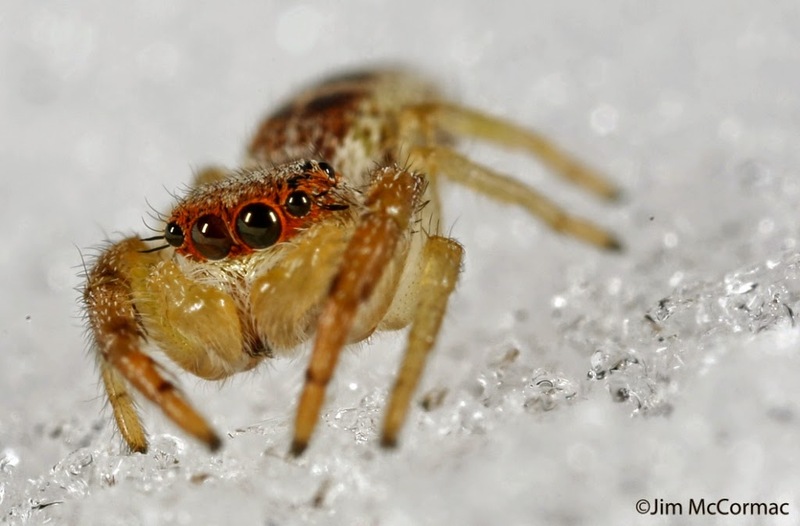 If this jumper was indeed hunting, it would appear to have little competition for the scores of stoneflies and other insects on the snow's surface. And now for the most bizarre of our finds, and an insect that was high on Laura's wish list. Our quarry was a small and poorly known group of winter insects whose larvae - and adults, perhaps - feed on mosses. We spent most of our time hunting and pecking in areas that had plenty of mosses exposed among the snow. Suddenly Laura let out an excited yell - she had found a snow scorpionfly! If you have any interest in bugs, it isn't hard to see why she - and us - wanted to find one of these things. Bizarre doesn't cover it. Note the long beaklike proboscis, proportionately massive goggle eyes, and strange segmented body. This is a male of the species Boreus nivoriundus, and its wings are reduced to odd comblike extensions used to grasp and hold the female during mating. 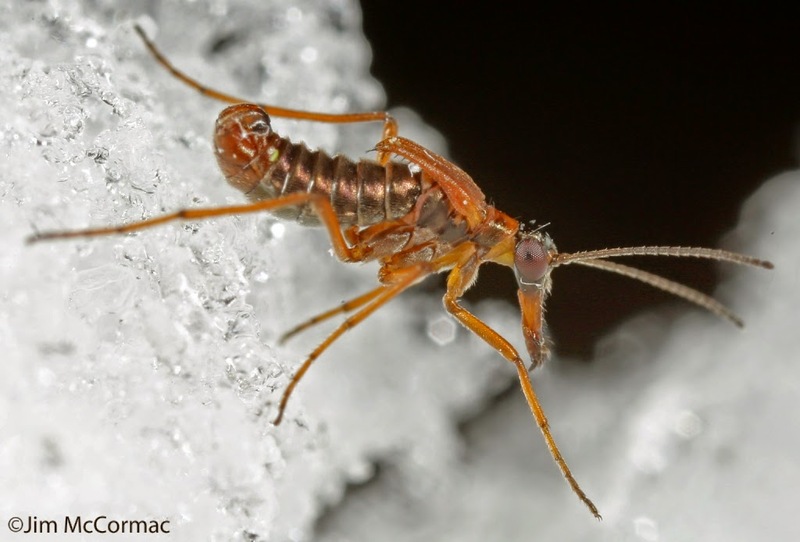 Snow scorpionflies cannot fly, but as we can attest, they can hop like fleas. Indeed, the group is though to be some sort of missing link between fleas and scorpionflies, and they are placed in the Boreidae family. This is a female snow scorpionfly. 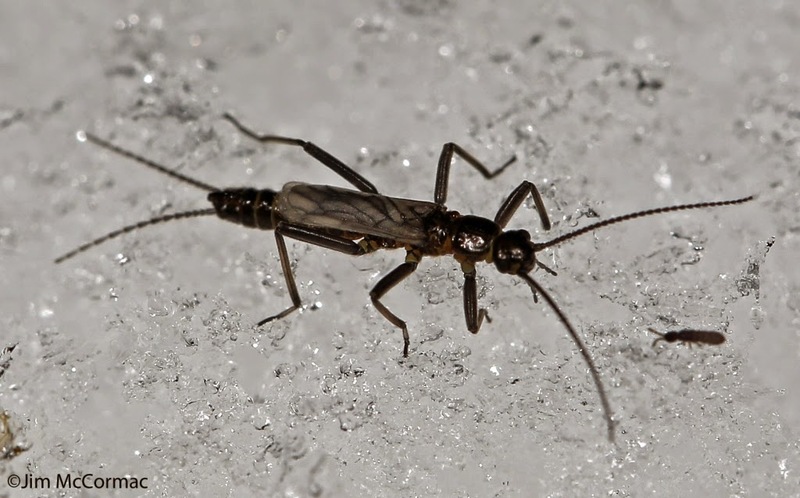 There are thought to be about 30 species of snow scorpionflies, and apparently only two of them occur in Ohio. This is a female of the other species that we're known to have, Boreus brumalis. With a big dose of beginner's luck, I suppose, we found both of them on our inaugural snow scorpionfly hunt. Much thanks to Benjamin Coulter, who identified these species for me. In spite of her strange appearance, this snow scorpionfly is visually interesting. Her body looks as if it is forged from polished bronze, and she sports a formidable torpedo-like ovipositor. Perhaps she uses that appendage to push her eggs deep into moss beds. Insects are ectothermic - they cannot generate body heat. In order to prevent the formation of ice crystals within cells, which would spell doom, insects that are exposed to harsh northern winters are supercharged with proteins and chemicals that reduce the freeze point of internal liquids, thus avoiding death by crystallization. Apparently snow scorpionflies and the other animals mentioned in this post have taken the art of supercooling survival to the nth degree. There are obviously good reasons why some insects emerge in the dead of winter, or they would not have evolved the ability to do so. Possible reasons include predator avoidance - not nearly as many potential enemies would be active in cold air on the snow's surface. However, as the jumping spider potentially demonstrates, there are probably some enemies afoot. Rare indeed would be the situation where a large crop of food is readily available, and no one is there to plunder. The snow's surface is also a great "single's bar". It would seem to be very easy for males and females to find one another on the stark white surface. There may also be food sources available that wouldn't be present at other times of the year. 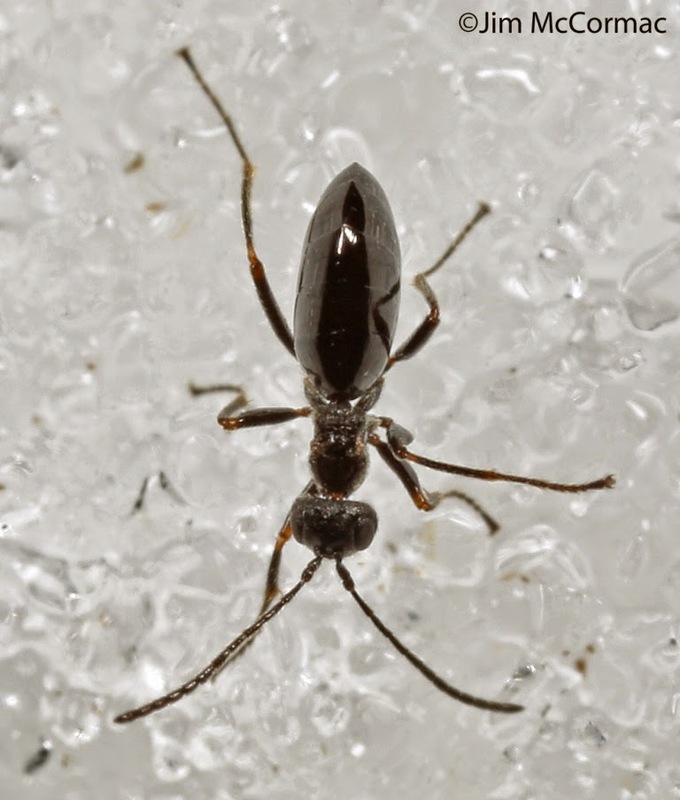 Also, a winter emergence might allow the insect to lock up its eggs and/or larvae in well concealed places during the rush of the warm seasons, when legions of predators are active. Our group pauses along a little-traveled road through wide open spaces on American Electric Power land bordering the Wilds. We were looking for various raptors, Short-eared Owls, and whatever might come along. Yesterday was the 11th annual Ohio Ornithological Society field trip to the Wilds. The OOS began this traditional field trip soon after its founding in 2004, and it has remained wildly popular. About 120 birders from all over the state showed up yesterday, and that's the maximum number that can be handled. It's been like that about every year. The only one that I can recall significant numbers of no-shows was the year that the thermometer read -12 F (MINUS TWELVE) at the rendezvous site in the morning. About 30 or so people decided to skip out that time. Frigid temperatures were not an issue yesterday. The thermometer rose to a balmy 51 degrees at the high point. As always, the day was great fun, and thanks to the OOS, all of the field trip leaders (eight separate groups), and especially Randy Rogers for tackling organization. Oh and of course - the staff at the Wilds for graciously opening their doors to us at a time of year when they're normally shut down to the public. As is often the case when I'm leading groups, the camera gear remains stowed in the trunk. There's just no time to click off lots of photos, so we'll have to make due with some iPhone shots for this post. I've only missed one of these events, I think, and yesterday's was probably the best, at least for our group. Here, a bunch of excited people ogle a Golden Eagle that put on a show over the distant fields. We had the bird in the scopes, and everyone enjoyed watching a pair of Rough-legged Hawks strafing the much larger bird. Scott Albaugh and company found a Wilson's Snipe in a seepage outflow, and provided us with that intelligence after lunch. Our group headed there, traversing an extremely pitted and muddy road, and managed to locate two snipe - not bad for mid-January in Ohio. Our group, which changed form a bit throughout the day, awaits the flight of the Short-eared Owl at day's end. This is a tradition. We only saw one distant bird, and then another practically hit my car on the way out. We had lots of nice sightings over the course of the day, though, including excellent looks at other raptors. I don't know what the final collective tally of species was, but it may have been a record. The OOS winter trip to the Wilds would not be complete without a foray into the rhino house. This baby Southern White Rhino is only about two months old, and is dwarfed by his nearly two ton mother as he nurses. The youngster absolutely loves attention from people, and he was on cloud nine yesterday as scores of birders oohed and aahed over the leathery little fellow. I believe the date of next year's OOS/Wilds trip has been set: January 16. Try and make it; you're sure to have a good time. 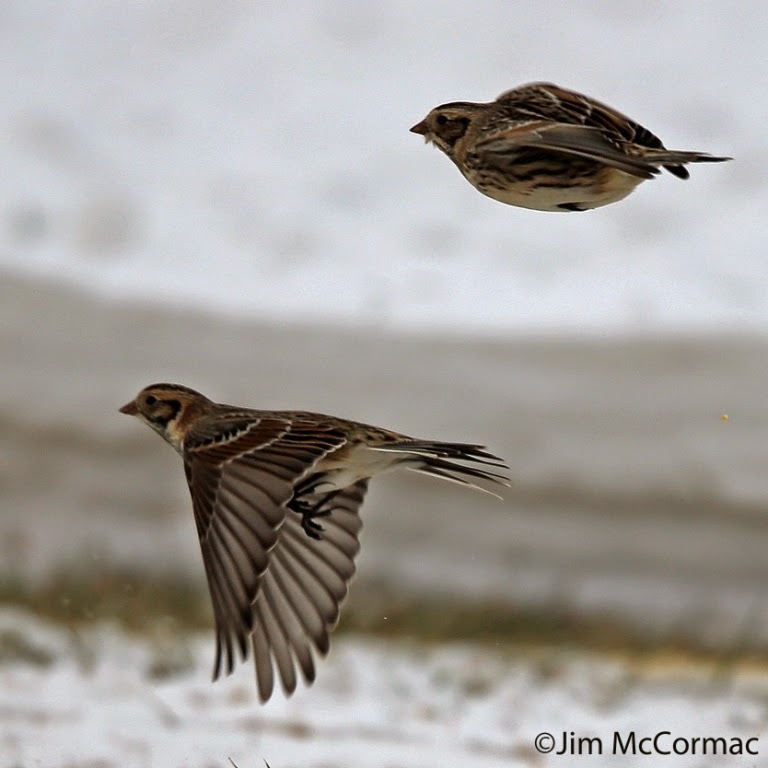 A flurry of Lapland Longspurs noshes on specially ground cracked corn. All birds should have it so good. 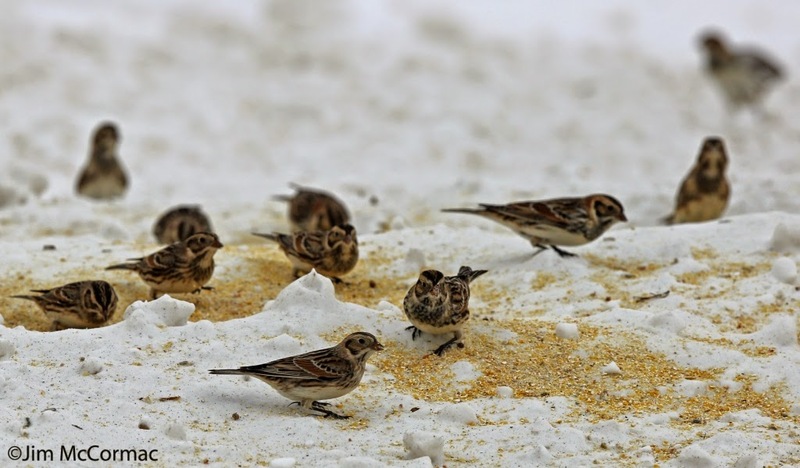 Last winter - the "polar vortex" freezeout - I wrote about a fantastical place in Delaware County, Ohio that hosted thousands, and thousands, of Snow Buntings. That post is RIGHT HERE. The birds' hosts are Mike and Becky Jordan, and they have the art of attracting birds of wide open spaces down to a science. Scatter some 50 lbs. of cracked corn (a day!!) along the driveway and other select spots, and sit back and watch the show. 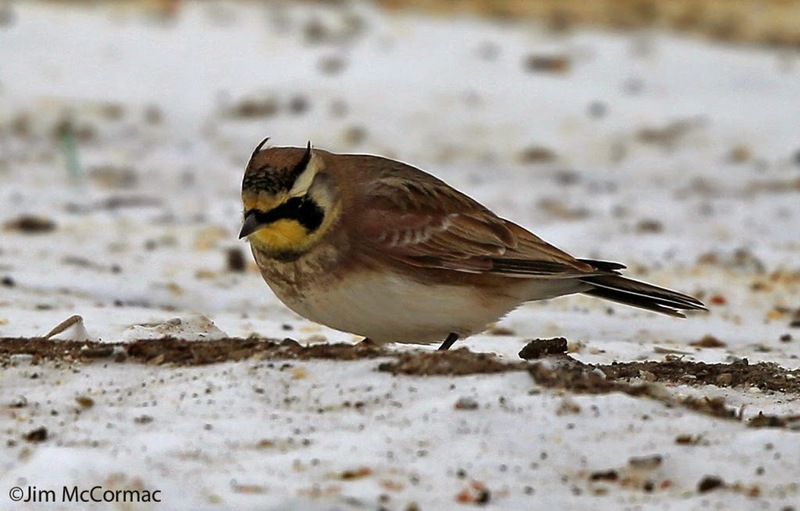 Their farmhouse is surrounded by big fields, and when the longspurs, buntings, and Horned Larks aren't out there somewhere, they're visiting the Jordans. A handsome male Lapland Longspur alertly watches his surroundings. He is preparing to make his way to the yellow windrows of corn that trace the Jordans' long driveway. I made my way to Mike and Becky's place last Sunday, after receiving reports of hundreds of longspurs. 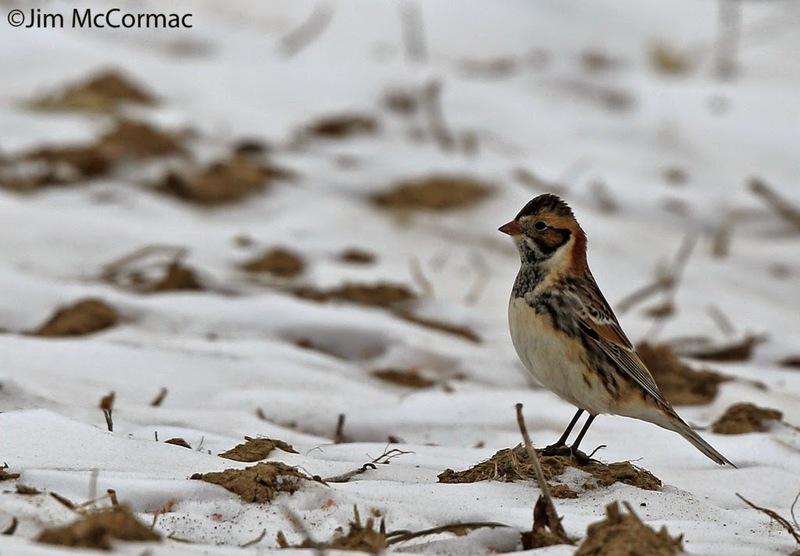 The winter has not yet been brutal enough to drive in the hardier Snow Buntings, but just wait. 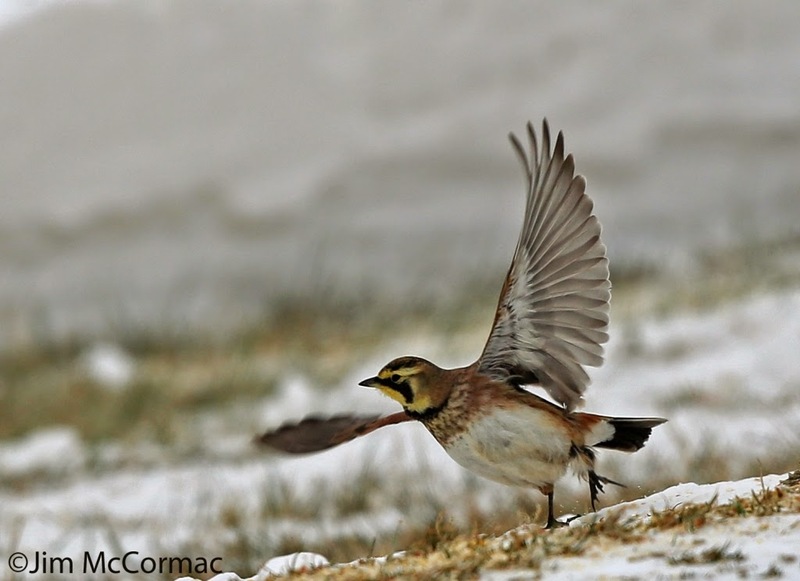 The buntings tend to arrive after extended deep snow cover, and even more larks and longspurs will come in then as well. As soon as I approached the driveway I saw perhaps a couple hundred longspurs and larks. In I went, and spent a pleasurable few hours watching the birds, making some photos, and catching up with the Jordans. The only lamentable point of the day was the weather. It was cold, which bothers me not a whit, but the sky was the all too typical leaden gray of an Ohio winter. Pair that with white snow on the ground, and capturing vibrant images of birds becomes quite tough. A blue sky can really make them pop. But one takes what one gets. A pair of longspurs rockets by. The flocks are always on edge, their twitchiness in large part due to the ever-present threat of raptors. Birds will explode into the air for no apparent reason, swirl about, and settle back in. 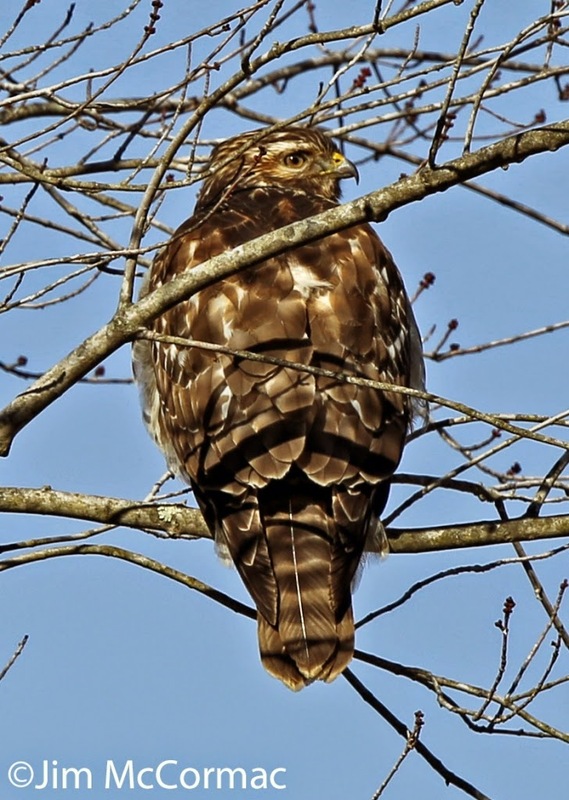 Sometimes the reason is very apparent, such as when a female Sharp-shinned Hawk winged into the yard and sat for a bit in one of the silver maples. Northern Harriers, Cooper's Hawks, American Kestrels, and even buteos such as Red-tailed and Rough-legged hawks have learned that potential meals are here, and make regular visits. While a few Snow Buntings have been present off and on, none were in evidence during my visit. However, lots of Horned Larks were. Larks, buntings, and longspurs form the Big Three of mixed flocks in open country in this part of the world. Typical views of Horned Larks are of small mousy brown birds flushed from the verges of country roads as one whips by in the auto. Watch the fleeing birds closely, and you'll see the contrasting black tail of the lark - a surefire field mark. One of the great things about visiting the Jordan's uber feeding station is the close proximity of the birds. Actually seeing the namesake horns of a Horned Lark is usually not very easy. Mike and Becky are exceptionally gracious to birders that wish to visit. Last year they hosted about 1,000 people from Ohio and many other states. Mike cast out about 2.5 tons (Tons, with a T!) of cracked corn last winter! Best conditions occur when there is enough snow on the ground to fully cover the soil. Forecasters aren't calling for any of the white stuff for a few days, but this being Ohio one never knows what Mother Nature will throw our way. I'm sure great bunting/lark/longspur conditions will arise before too long, though. If you would like Mike and Becky's contact information, send me an email: jimmccormac35 AT gmail.com. I'll pass it along with some other helpful tips. 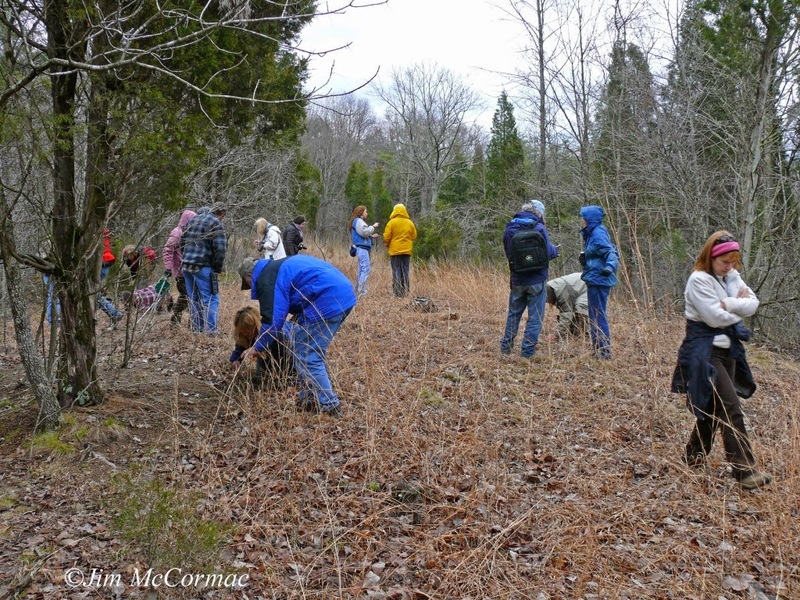 In my last post, I announced the upcoming Tree & Shrub Workshop to be held Saturday, February 28 at the Caesar Creek Lake Visitor Center in Warren County. For details, either scroll down to the last post, or CLICK HERE. Chief organizer Kathy McDonald told us today that we already have 73 people, including paid attendees and helpers/speakers. Wow, that didn't take long. We had originally planned on about 75 people, but can expand to comfortably accommodate at least a few dozen more. We want everyone to learn more about woody plants, have fun hanging around like-minded people, and enjoy some interesting field trips. So, should this sound of interest, get your registration in soon. We'd love to have you. Just CLICK HERE for registration info. The expansive Army Corps of Engineers Visitor Center at Caesar Creek Lake in Warren County, Ohio. This building, and its location, is picture-perfect for hosting natural history events. And it is here where an interesting Tree & Shrub Workshop will take place on Saturday, February 28 from 9 am to 3:30 pm. The event is hosted by the Midwest Native Plant Society, the outfit that brings us the annual Midwest Native Plant Conference in Dayton. CLICK HERE for full details on the Tree & Shrub Workshop. 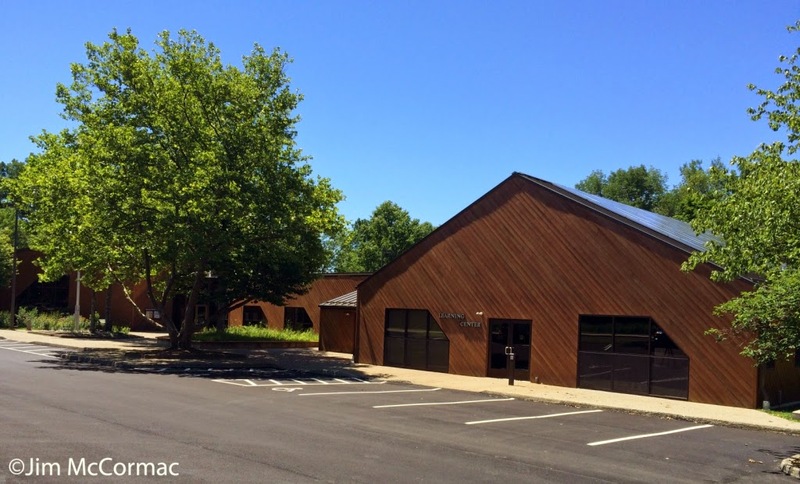 The Visitor's Center is conveniently located near Interstate 71, a couple of stone's throws north of Cincinnati and only about an hour's drive from Columbus. 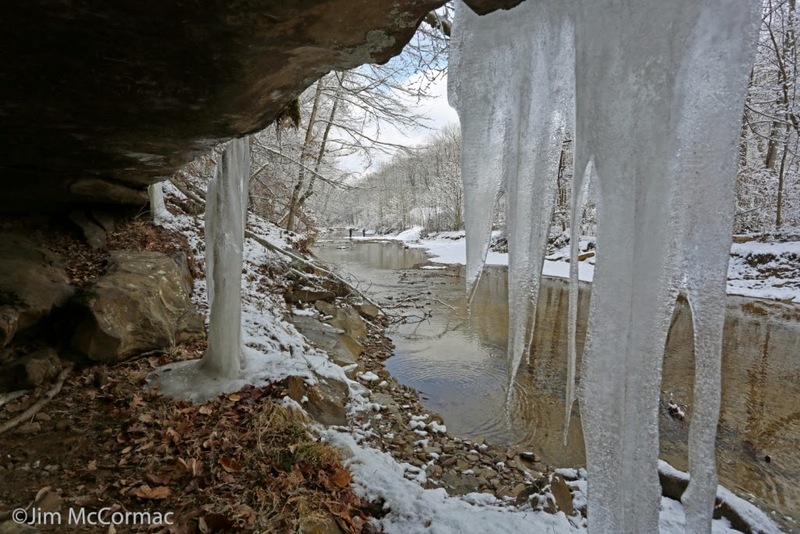 CLICK HERE for more info about the center and Caesar Creek. As an added bonus, great habitat abounds within minutes of the center. We'll of course have some field trips following the speaker portion of the event. Those who are so inclined can stay for the dusk American Woodcock extravaganza. There is a great courtship field a few minutes from the center, and these comical sandpipers - our only woodland-breeding sandpiper! - should be back and doing their sky dances. A gargantuan Tuliptree, Liriodendron tulipifera, reaches for the sky. Ohio hosts some 220 species of native woody plants, but not all of them attain this sort of mass. Size aside, all of our shrubs and trees play an inordinately important role in ecosystems, and support an enormous array of animals. 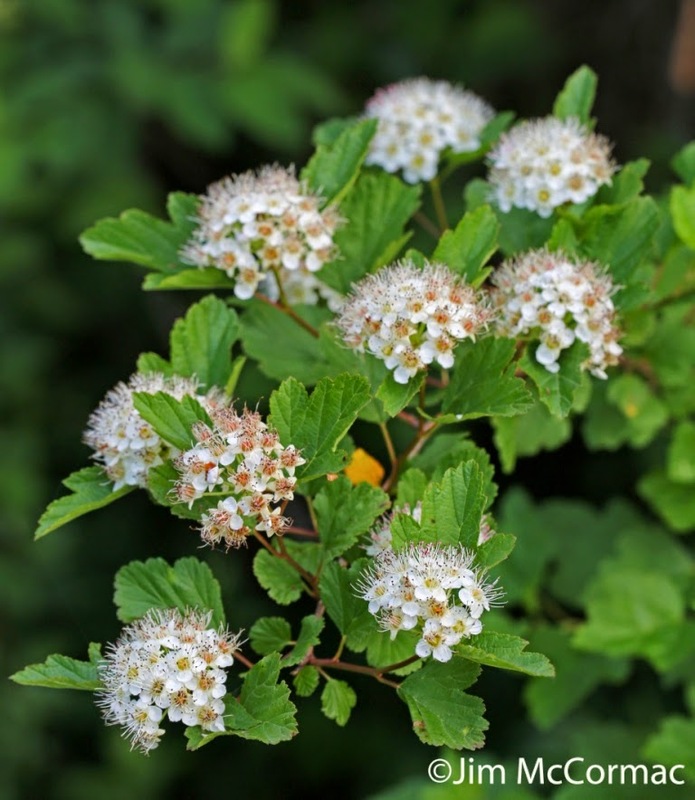 An absolutely striking shrub that would be at home in any garden, formal or "natural", is the Ninebark, Physocarpus opulifolius.This native member of the rose family looks good at any season, and when in flower is dynamite for pollinating insects. Four speakers will fill the morning and early afternoon: Casey Burdick of the Ohio Division of Forestry; Brian Jorg of the Cincinnati Zoo; Solomon Gamboa of Pioneer Landscapes LLC; and yours truly, the driver of this blog. A Blue-headed Vireo weaves her ornate cup into the forked twig of a Red Maple, Acer rubrum. As you likely know, the majority of our nesting songbirds depend upon woody plants as the structural support for their nests. This is just one of scores of important roles played by trees and shrubs. A tasty little inchworm, the Maple Spanworm, Ennomos magnaria, locomotes along a twig. 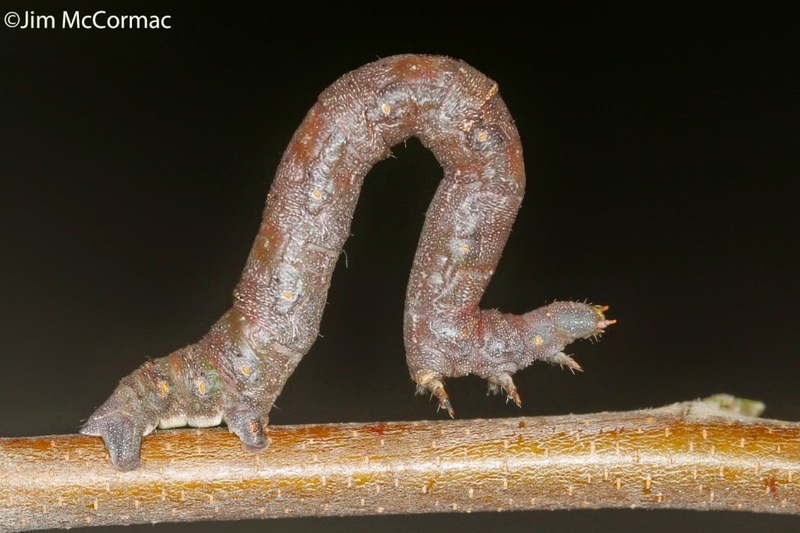 Birds love inchworms - for food - and you can be assured that the vireo in the preceding shot would make a meal of this larva in a New York second were the bird to spot it. Trees and shrubs grow the lion's share of caterpillars, at least in this part of the world. Producing scads of tubular moth and butterfly larvae is vital, and is one of the most important ecological roles that woody plants perform. Without lots and lots of caterpillars, we'd not have all of our beautiful songbirds. The overarching ecological roles played by woody plants is the gist of my talk, which is entitled Ohio's Botanical Workhorses: Trees and Shrubs. Solomon Gamboa and Brian Jorg will discuss in detail the best species of plants for yardscapes, and how to best make them grow. 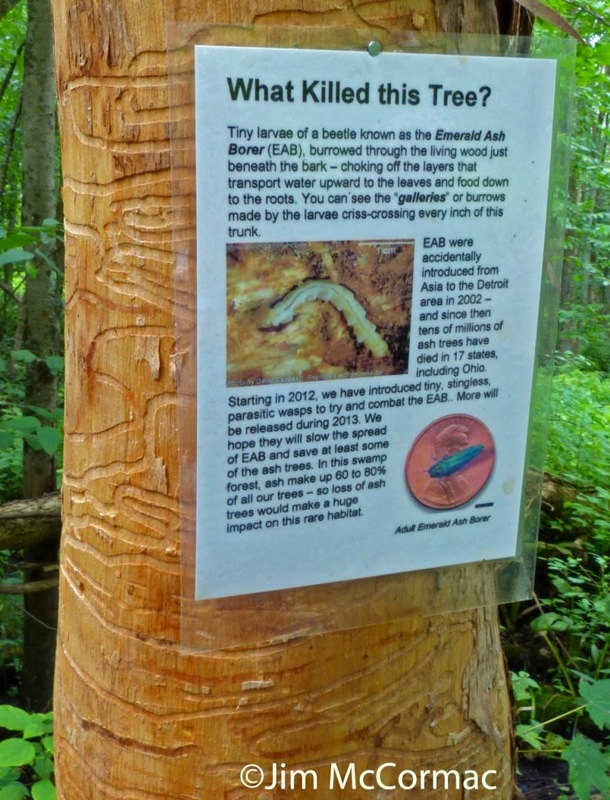 Trees seem to be under constant siege by an over-growing cast of introduced insect pests, such as the emerald ash borer that killed the Green Ash in this photo. 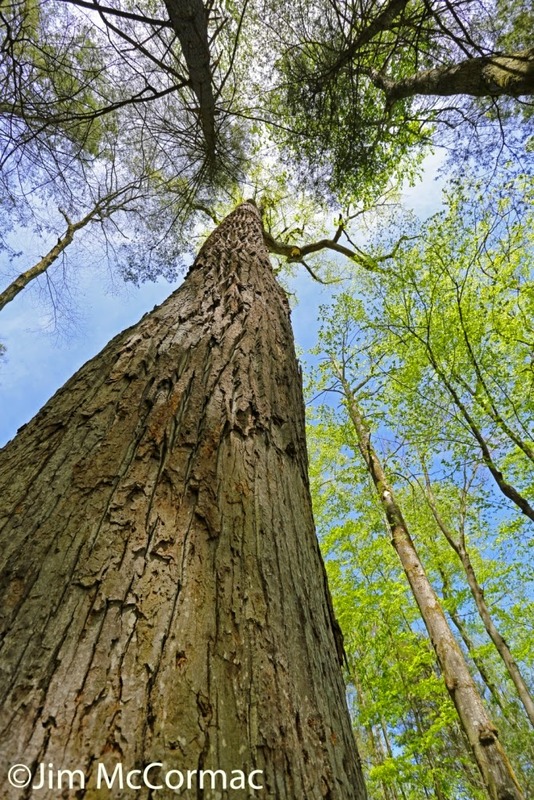 Casey Burdick of the Ohio Division of Forestry will provide an interesting and important talk about who is killing who in the world of trees, and what is being done about it. The event's organizer, Kathy McDonald, has also organized an all-star cast of characters to lead the post-conference field trips. This is sure to be a fun and informative day, and your $35.00 admission fee even includes lunch. Sign on soon, these workshops often fill up. This one is an especially good way to usher in spring with an informative blend of education and field work. All of the details, including registration info, are RIGHT HERE. About half of the world’s more than 62,000 species of vertebrate animals are mostly hidden from view — the fishes, which live in a watery world largely off-limits to people. The aquatic community is one of mystery; its secrets are only occasionally revealed to the casual observer. Dan Rice and Gary Meszaros are hardly strangers to aquatic ecosystems. Both men have spent decades surveying Ohio’s fishes, in every corner of the state. They have paired to produce a beautiful new book, Native Fishes of Ohio (Kent State University, 113 pages, $24.95). Their project shines a light on Ohio’s stunning fish fauna in a way that no previous work has managed. Rice spent much of his career as a zoologist with the Ohio Department of Natural Resources and dedicated much of his time to surveying Ohio’s fishes. Meszaros, a retired teacher, has been photographing natural history for almost four decades. Their pairing was the perfect combination to produce this outstanding book. Rice’s intimate knowledge of all aspects of the state’s fishes comes across in the text, and Meszaros’ incomparable photos provide visual pizazz. 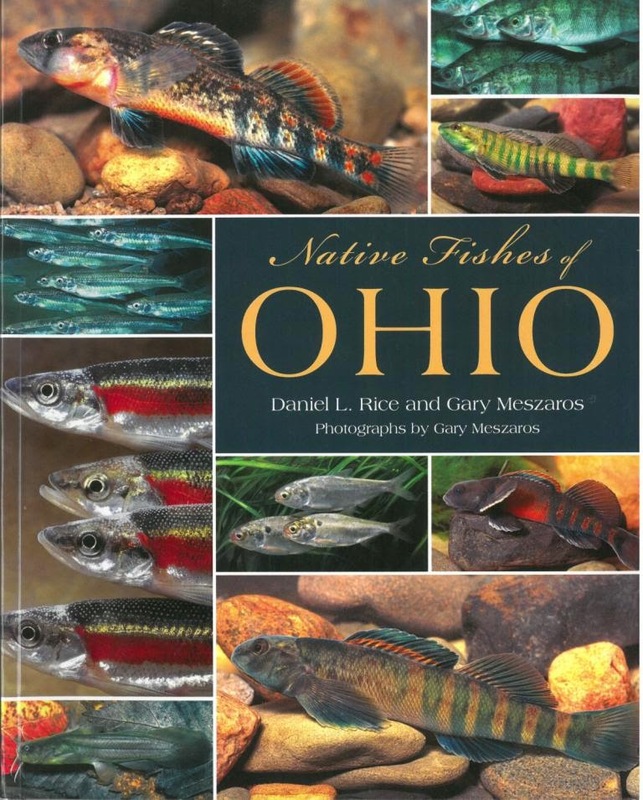 Native Fishes of Ohio features 156 color photos spread throughout its pages. The images alone are worth the price. Paging through the book is like viewing the inhabitants of a sophisticated zoo’s aquarium, except that these denizens all occupy Ohio’s wild waters. I won’t reveal photographic trade secrets, but a lot of knowledge and hard work — far beyond what is required of most photographic styles — goes into making images such as these. Seldom has a book featured such stunning photos of live fish. The book pictures 124 species — including everything a person is likely to encounter, as well as many rarities. About 146 species are known to occur in the state, but those not pictured are so rare that few people would ever encounter them. Each chapter introduction gives a robust overview of the family or families in question, peppered with habitat information, status in Ohio and behaviors. Following the introduction, photos are captioned with statements about the fish. 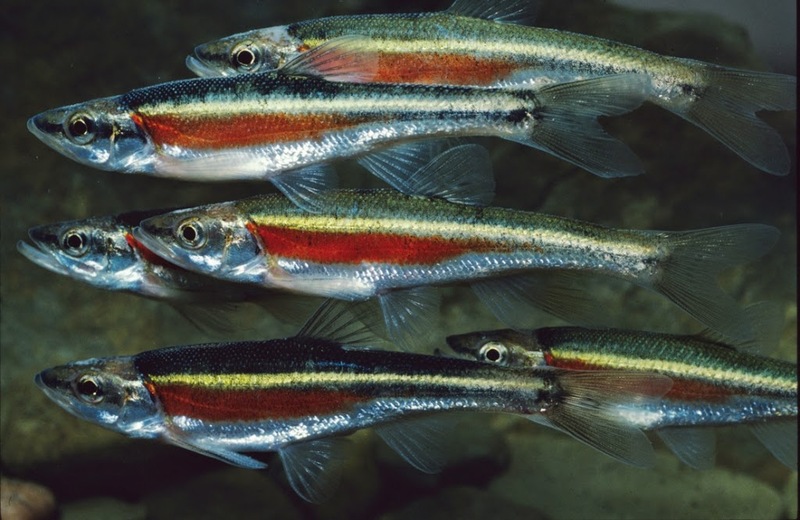 Native Fishes of Ohio opens a portal to a fascinating subsurface world that few people know well. Even seasoned fishermen will be surprised at what lives beneath their boat. I highly recommend the book. 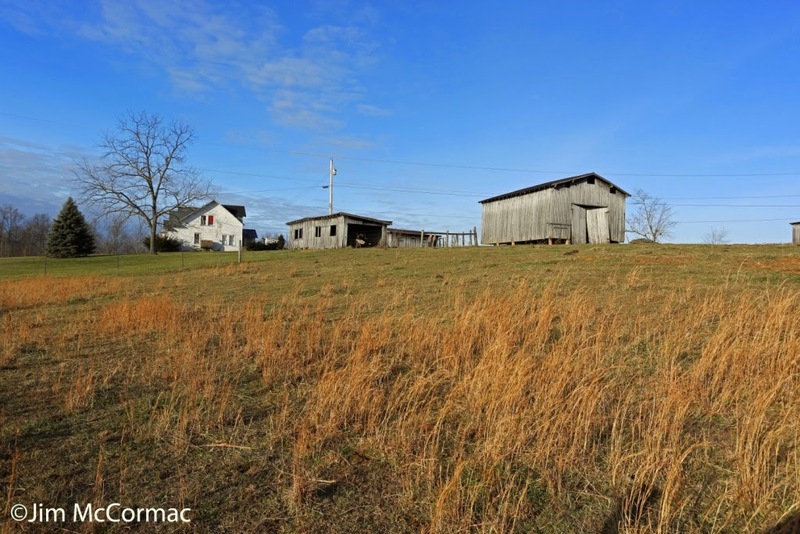 This old farm in Adams County, Ohio was where I started my New Year's Day, bright and early. My primary intent was to submerge into the vast Shawnee State Forest, which is in neighboring Scioto County, and shoot (with camera) birds. But when word got out that a Loggerhead Shrike had been frequenting this farm, I had to start here. Looking every bit El Bandido, the Loggerhead Shrike glares at the camera. If you are nearly any animal smaller than, or even up to the size of a shrike, you do not want to be affixed with this gaze. 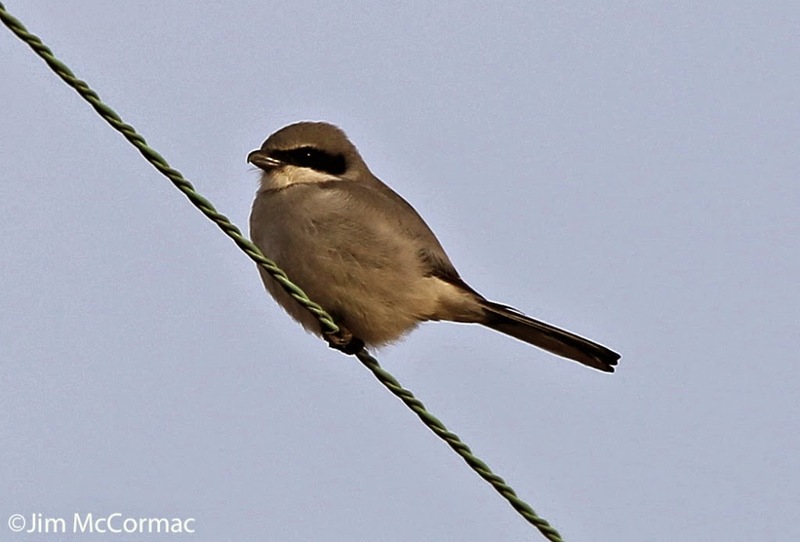 Our most predatory songbirds, shrikes capture, kill, and make mincemeat of other vertebrates. The only person there when I arrived was the ubiquitous and widely traveled Carlton Schooley. He had seen the shrike from afar before I arrived. I hadn't been there but ten minutes or so when the cooperative bird flew right in, and landed on a wire close at hand. It was almost as if it wanted to be admired, and admire we did. Loggerhead Shrikes were once fairly common and widespread in Ohio, but now are among our rarest birds. Only one or a few are reported annually. Adams County produces the most reports, and insofar as I know, the only recent breeding records have come from this county. I hadn't seen a Loggerhead in the state for a number of years, and needless to say was quite pleased to share this animal's company for a bit. After some time spent communing with the shrike, it was eastward bound and into Shawnee State Forest. My game plan was to look for mixed flocks of wintering songbirds, infiltrate their edges, and try for photos of whatever I might find. I was not alone in this game plan. This juvenile Red-shouldered Hawk was watching over a weedy, temporarily drained lake bed that was full of sparrows. I suppose the big raptor was lusting after sparrow meat, but it'd probably be a fat chance that this hawk would fly down a nimble sparrow. The raptor didn't much object to me, and distance was no problem for making images. Obstructions were. It would be nice if all of those intervening branches weren't in the way, but there was nothing to be done. The best that I could do was move until the raptor's eye was free and clear, which improved the shot. With animals, always shoot for the eye. 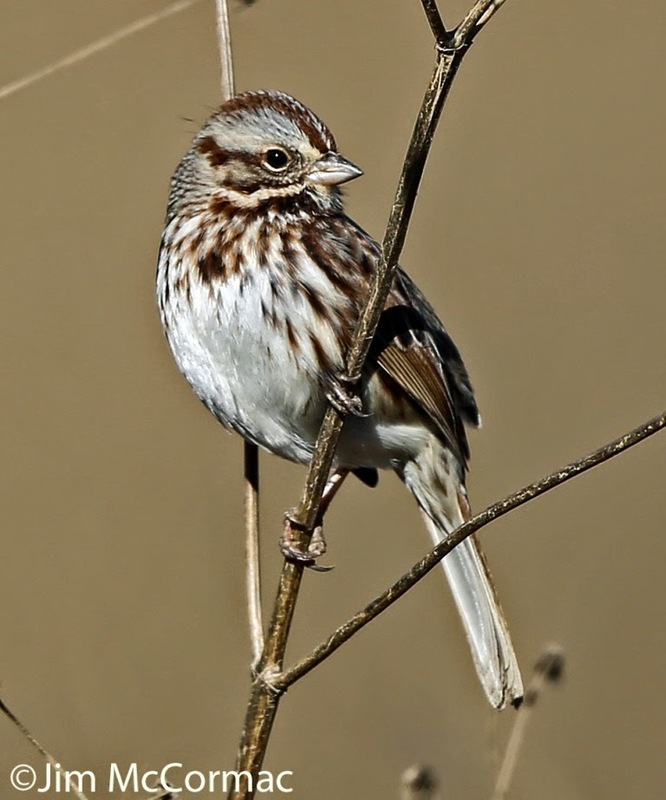 This Song Sparrow is one of dozens that fed on an abundant seed crop on the lake bed below the hawk. Also mixed in were Swamp and White-throated sparrows. Sparrows are habitually inquisitive, and it took just a few pishes and squeaks from me to send many of them to lookout perches. Rather than take just a plain mug shot, it is best to wait until a bird shifts into a more interesting posture, if possible. Finally this sparrow looked over its shoulder, giving me a better pose, and I fired away. This is a case where knowledge of your quarry helps immensely. Just heading afield, camera in tow, will probably yield some opportunities. But by knowing your prey and its habits, one greatly ups the ante in regards to capturing more subjects. I got out of my car near a small meadow surrounded by forest, and was greeted by the soft warbles of Eastern Bluebirds. Very good, I would be happy to make bluebird images. However, their presence also likely meant fruit was at hand, and sure enough there was a bunch of fruiting staghorn sumac at the back of the field. 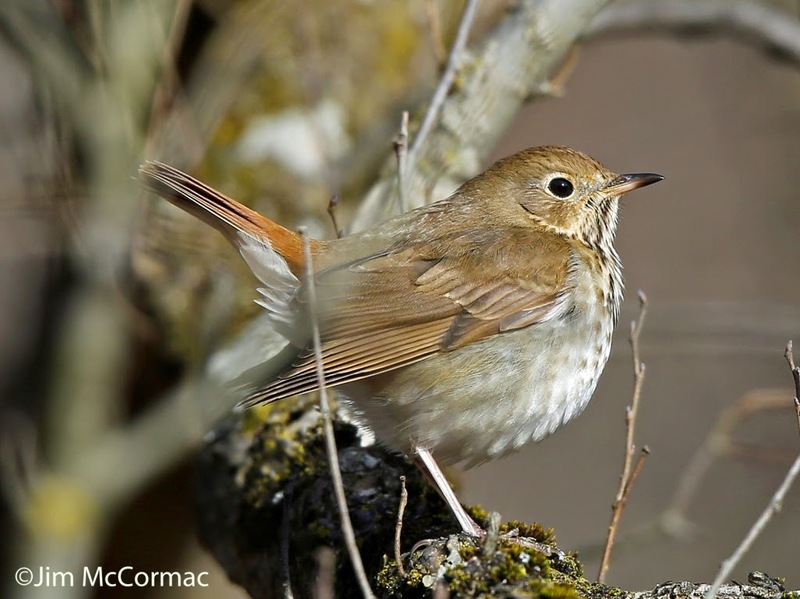 I worked my way back there, and it wasn't long before I heard the soft chuck note of this Hermit Thrush. A few imitations of his call, and the thrush came out to investigate. Flocks of fruit-eating birds are always worthy of a closer look. Often, other frugivorous bird species, like this thrush, will be amongst their ranks. 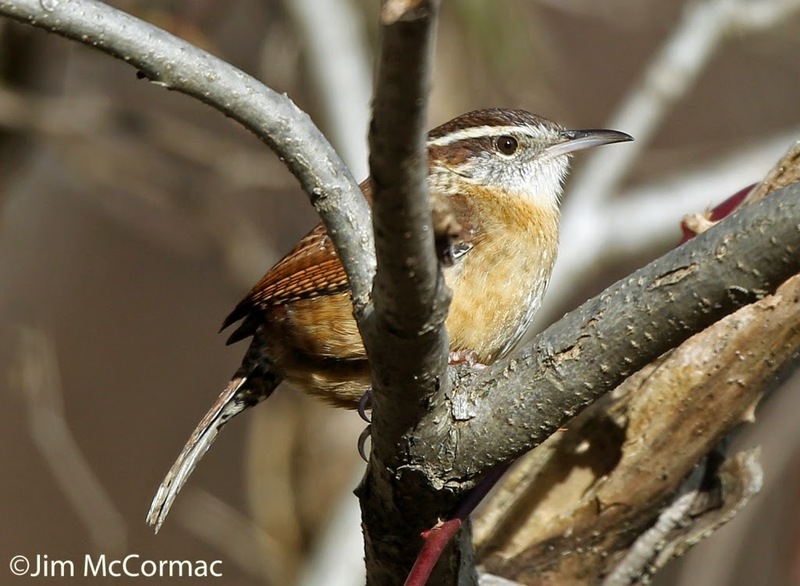 Much easier to detect than the thrush was this little motormouth, the Carolina Wren. It and its mate made no secret of their distaste at my intrusion, scolding, making their incredible rattlesnake imitations, and even occasionally breaking into a loud clear Tea-Kettle Tea-Kettle song. Wrens are busybodies, and quick to chastise anyone or anything that displeases them. At one point I heard the thin lisping tsee-tsee-tsee of Golden-crowned Kinglets, and of course instantly braked. I brake for kinglets. Hopping from the vehicle, I realized that a platoon of four kinglets were working the trees and shrubs. This is a truly elfin songbird; at only 6 grams, it is our smallest (in Ohio) passerine. 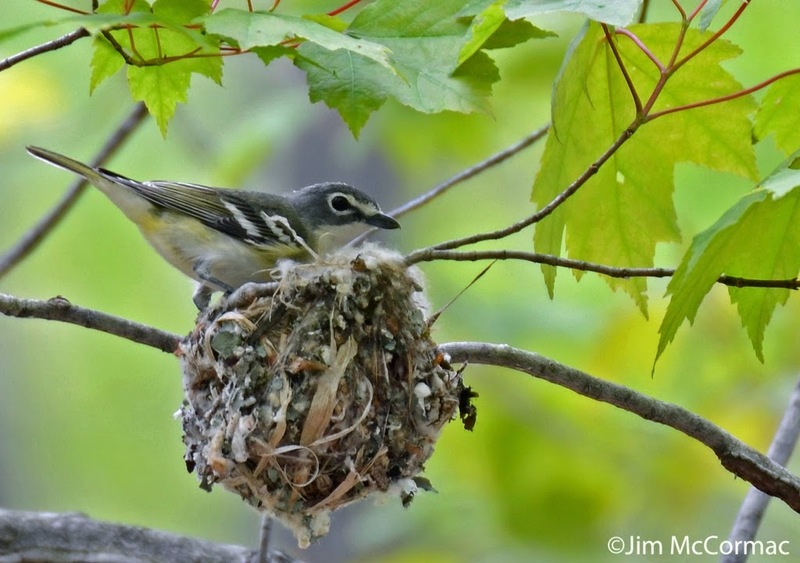 A kinglet weighs less than two Ruby-throated Hummingbirds (which is not a songbird), and that's really small. What's more amazing is that kinglets are almost entirely insectivorous, but they ride out winters in Ohio, and even points well to our north. A kinglet's bright little eye reflects the life of a creature filled with the energy and inner fortitude to survive brutal winters. I was flattered to be the object of its attention, fleeting as it was. Kinglets have no time to trifle with foolish humans. It is work, work, work. 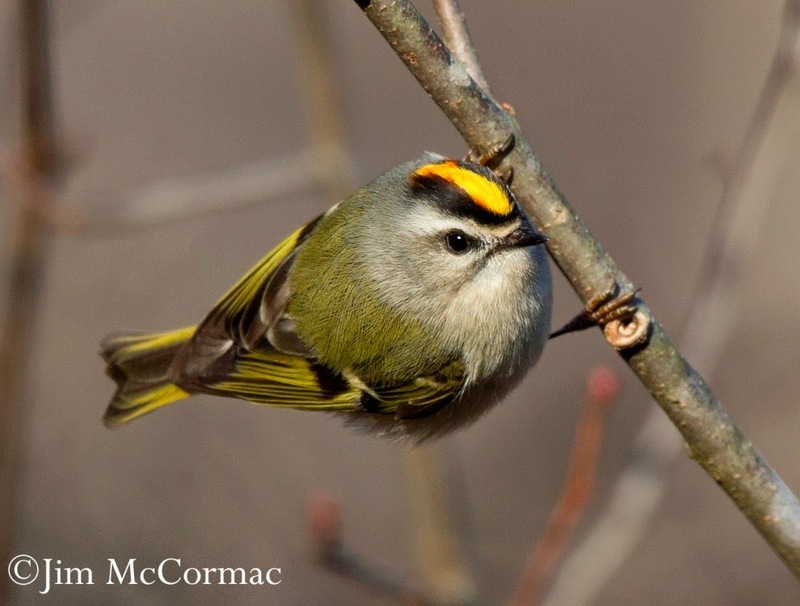 Golden-crowned Kinglets must harvest a considerable percentage of their bodyweight in tiny invertebrate prey each day in order to stoke the fires and keep up their metabolism. Where, you might rightly ask, are all of these insects in winter? How do the kinglets, clever and industrious as they may be, find them? I'll delve more into that mystery a bit later. Suffice to say that our trees and shrubs are not lacking in spiders, caterpillars, stoneflies and other insects, even in the dead of winter. 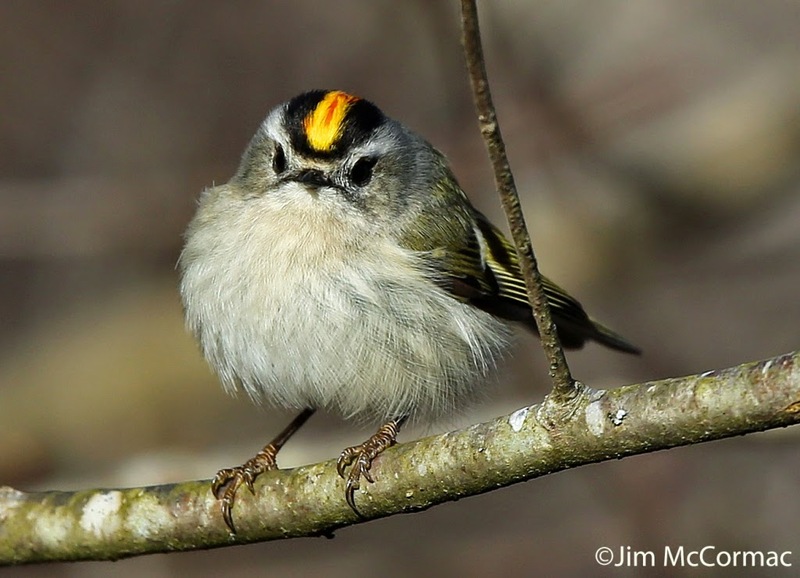 Kinglets are extremely adept at finding them, and thus reduce the need to make perilous long distance migrations as nearly all of our other highly insectivorous songbirds must.